Daily Messes: International Talk Like A Pirate Day is 9/19! International Talk Like A Pirate Day is 9/19! Are you ready to don your pirate hat and seek treasure and adventure? 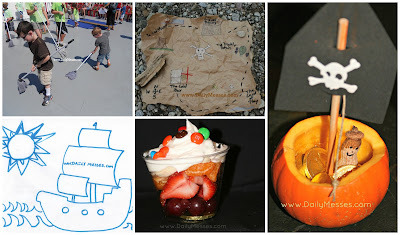 If you've misplaced your treasure map, here are some ways to celebrate! Have a coin toss! Similar to my St. Patrick's Day Coin Toss, but make a treasure chest using shoe box or other cardboard box.